Product News Tuesday, January 29, 2019: Specialised Imaging Ltd. Designed to capture 11-million-pixel resolution images the Specialised Imaging SIR3 ballistics range camera provides more detail than any other high-speed camera in its class. The compact, lightweight SIR3 sets a new standard for ballistic range testing with its unique ability to acquire two separate full resolution images enabling valuable displacement and velocity information to be determined in ballistic, detonic and impact studies. The rigid all-metal IP54 compliant construction of the compact SIR3 makes it ideally suited to withstand even the harshest outdoor environment. Jo Cleaves, Sales & Marketing Director of Specialised Imaging commented "When capturing images of really high-speed ballistic events with a tight field of view you really need a camera that can take a picture within nanoseconds of the trigger. In addition to capture images with minimal blur you require a range camera able to capture and record data with nanosecond exposure times. This is not possible even with the even the highest speed video camera". 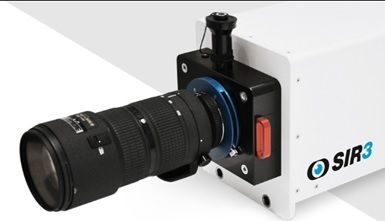 A high speed 1Gbps Ethernet link enables the SIR3 to be easily integrated into almost any imaging environment. Comprehensive operational software provides simple control of imaging parameters and extensive measurement tools to accurately analyse results. Image archiving in a wide range of industry standard file formats is supported. For situations where more complex measurements are required, several SIR3 cameras can be operated from a single control computer with timings for all camera linked to the same control screen. The Specialised Imaging SIR camera range is proven in leading ballistics proofing ranges around the world. Its latest iteration the SIR3 sets a new benchmark in terms of blur-free data quality, ultimate resolution, high sensitivity and precise timing accuracy. For further information on the SIR3 ballistics range camera please visit https://www.specialised-imaging.com/products/still-cameras/sir3 or contact Specialised Imaging on +44-1442-827728 (UK) / +49-8141-666-8950 (USA) / +1-951-296-6406 (Germany) / +86-1068-651-769 (China) / info@specialised-imaging.com. Founded in 2003 - Specialised Imaging is today widely recognised as a leading designer and manufacturer of innovative, high performance ultra-high-speed imaging cameras for industrial, scientific and defence research applications. The company continues to invest strongly in research and development to maintain its position at the forefront of world-wide innovation in the high-speed imaging field. Specialised Imaging maintains offices around the world to support its extensive base of customers in North America, Asia-Pacific, Europe and the Middle East regions.